Downie also won a Juno for Artist Of The Year. Sarah Harmer performs during a tribute to the late Gord Downie at the Juno Awards in Vancouver on Sunday. Sincere. Courageous. Honest. Dear Friend. Big Brother. That was Gord Downie. Canada's Who's Who came together to celebrate Canada's poet soul in a tribute at the 2018 Junos Sunday night. It was, as expected, a tribute both beautiful and sad. But also a moment of celebration for the late Tragically Hip frontman, who won three awards, including Artist Of The Year. In a pre-filmed montage, a host of celebs each described one word to describe the musician and activist. Don Cherry, Fashion Santa, Prime Minister Justin Trudeau, Tessa Virtue and Scott Moir, Hugh Dillon, Atom Egoyan. Everyone, it seemed, loved Gord. 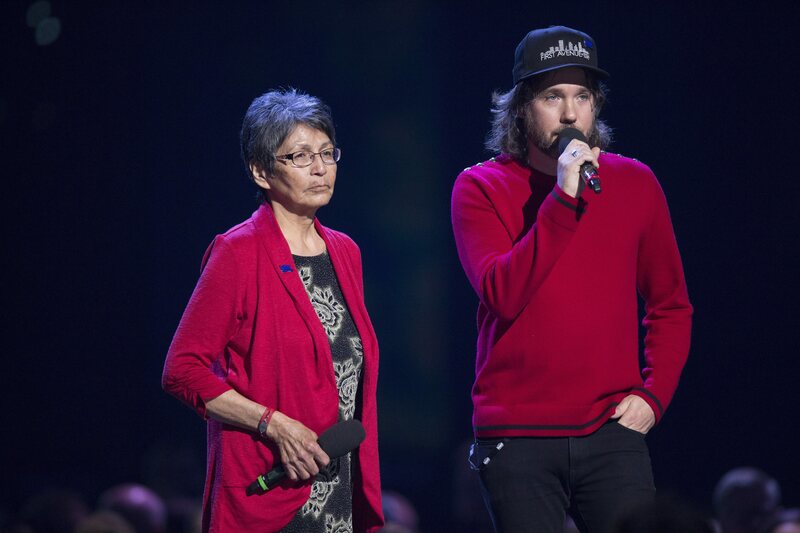 Pearl Wenjack and Kevin Drew give a tribute to the late Gord Downie at the 2018 Junos. "Gord Downie taught us all what it means to be alive and how to exit this world with love and compassion," said musician Kevin Drew, who introduced the musical portion of the tribute with Pearl Wenjack. Downie, he said, asked Canadians to take a good look at the history we'd been taught to ignore, referencing Downie's work to highlight reconciliation and establish the Gord Downie Chanie Wenjack Fund. Chanie was Pearl's brother, and an Ojibwe First Nations boy who died from exposure and hunger after he ran away from a residential school in 1966. 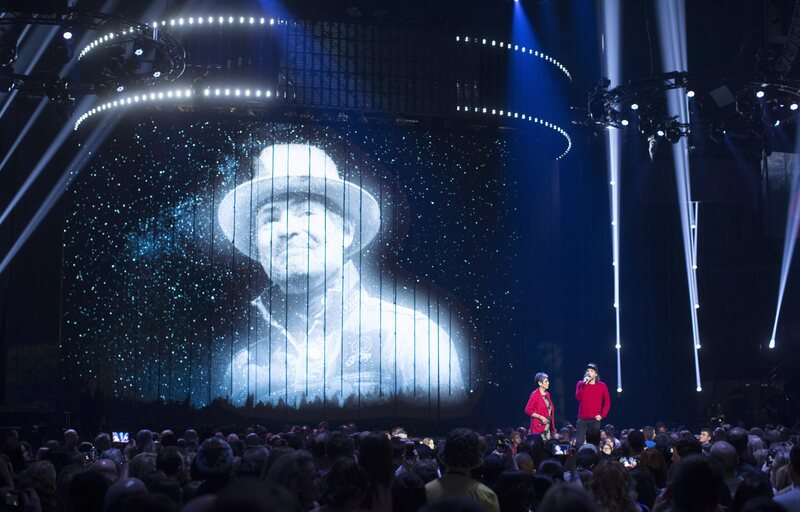 Kevin Drew, right, and Pearl Wenjack speak onstage as an image Gord Downie is projected during the Junos tribute. Downie was given a name, Pearl said. "'The Man That Walks Amongst The Stars.' That is what he is now today," she said. And then, the tribute, simple but full of emotion. Musician Kevin Hearn on piano joined singer Sarah Harmer for Downie's "Introduce Yerself," from his now-Juno award-winning album. And then Dallas Green from City and Colour performed The Tragically Hip's "Bobcaygeon," his voice echoing Gord's haunting delivery. 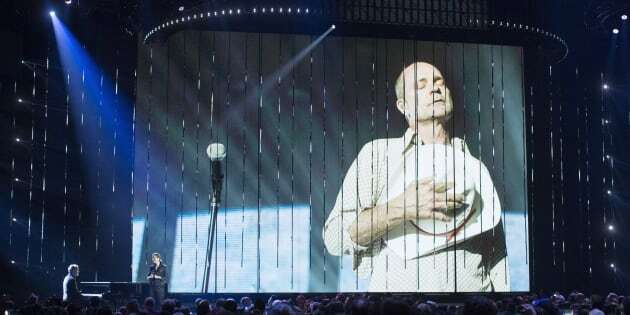 "If we have learned anything from Gord, it is the value of taking care of each other," Patrick Downie, Gord's brother, said as he and brother Mike accepted Downie's award for Artist Of The Year. "I'd like to believe we're all better artists and people because of him," Patrick added. 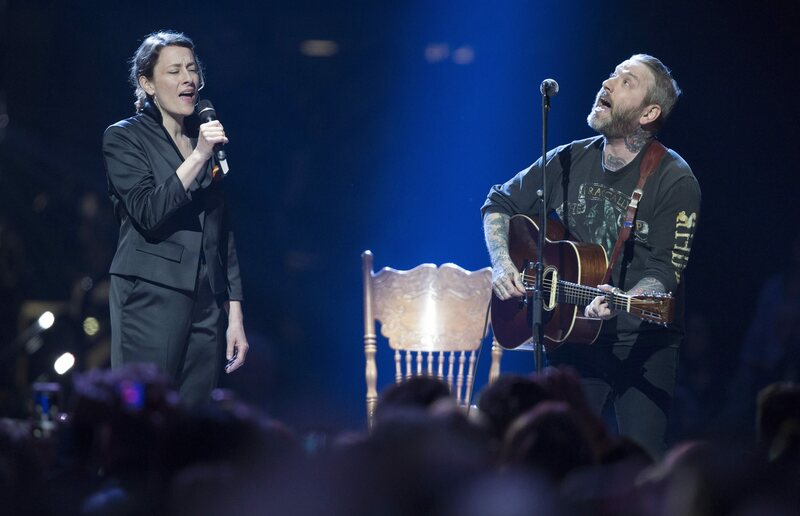 Sarah Harmer, left, and Dallas Green perform The Tragically Hip's "Bobcaygeon." The beloved Tragically Hip frontman, who died last October, was also honoured with two awards Saturday during a non-televised awards segment: Songwriter Of The Year and Adult Alternative Album Of The Year for "Introduce Yerself." Gord's brothers, Patrick and Mike, accepted the awards on his behalf, and said there would be more music in the future from Gord. "There's a lot of material that he was doing all along, a lot of material he created after he found out he was going to die," Patrick said. "Songwriting was his vehicle. He just went to work. He was not going to leave this world until he had spoken his language." 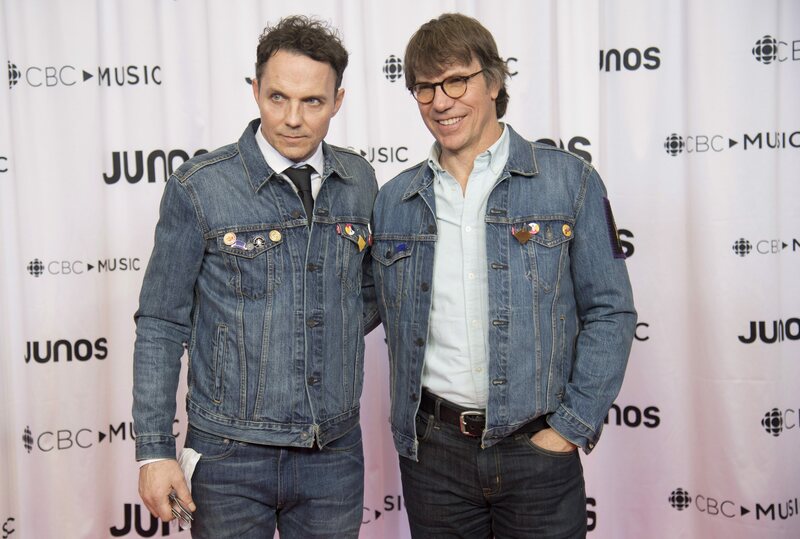 Pat and Mike Downie, brothers of the late Gord Downie, are seen at the Juno Gala Dinner and Awards show in Vancouver on Saturday. The brothers didn't say when Downie's other projects would be released. Mike added that his brother's "work ethic was unbeatable." "Gord never stopped working. Two operations, chemo, he never stopped," he said. "In the last two years he somehow had this idea of what he wanted to accomplish and he just went right down the list." The fans thank you, Gord. Lisa Yeung Managing Editor, Lifestyle, HuffPost Canada.